I just put a couple of pecan pies into the oven to bake. They are for tomorrow’s Women of the World luncheon held in the basement of the Universalist Fellowship Church in downtown Orono. 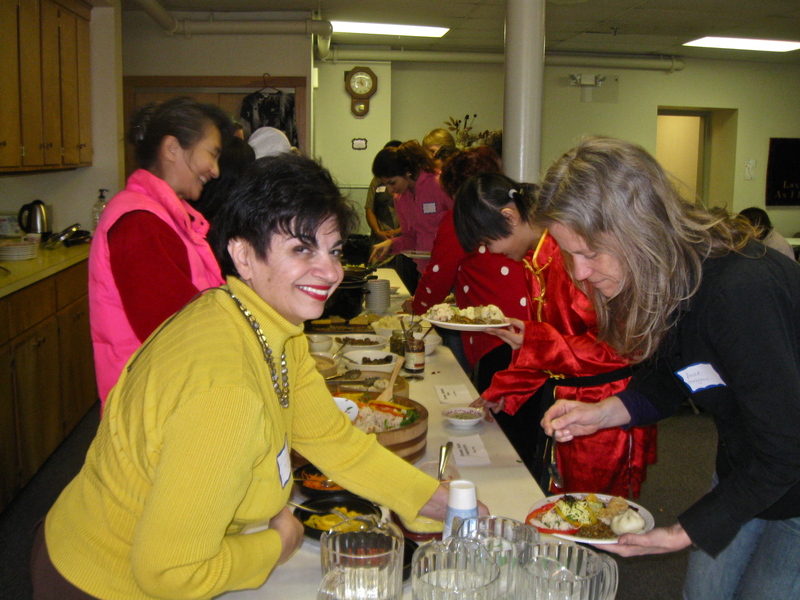 Women of the World is not a church group, but this church with a large commercial kitchen and dining room welcomes this decades old organization that began with a group of foreign students and faculty wives from the University of Maine. It has since expanded to include other university students, faculty and staff as well as members of nearby communities. Now we meet each month during the school year to share a meal with a particular country or region of the world as the theme. This month we are highlighting the American South, so the pecan pies fit in nicely. What began as a sort of buddy system for introducing foreign students and spouses to one another and to American culture has become a vehicle to promote multi-cultural understanding and interest on a very personal level. We currently have women from six continents and over 30 countries. This helps to insure some personal knowledge and experience in preparing the meals and the presentation that follows. There is no membership fee but a nominal donation is requested at each luncheon that goes towards a scholarship that Women of the World award each spring to a deserving student who is seeking to study abroad. One of my neighbors invited me to a luncheon about a year after I had moved to Maine. I was hooked. Sharing a meal with people of different backgrounds, cultures, ethnicities or religions is a way to break down barriers and misconceptions about others we often know little or nothing about. It’s a way to develop not only tolerance but an understanding that although we come from different places we share many of the dreams and hopes and loves that tend to bind rather than separate. The dream of a peaceful world, the hope for health and happiness and the love of family and friends old and new just to name a few. As I began to volunteer to cook, I discovered another benefit, learning to prepare dishes from around the world. Some I had heard of and always wanted to try and still others that I never thought of but found to be quite tasty. And always there were women willing to share their culinary and cultural experience. I am now in my third year as a co-coordinator of the Women of the World. I share the role with a Vietnamese/Chinese American doctor and an Iranian educator. It can be a lot of work, but it is also one of the most rewarding things I have ever done. This entry was tagged breaking down barriers, misconceptions, multi cultural understanding, new culinary experiences, shared meals, Volunteering, Women of the World. Bookmark the permalink.